On March 11, 2014, at the age of 91, Willie Bader made American history come alive for students at Ponchatoula High School. Gaining the attention of a teenager is no small feat, let alone through a lecture on history given over the course of two days. But Willie had students on the edge of their seats, hanging on his every word as he recounted the rise of Axis powers and the Allied response that ended World War II. Upon the conclusion of his presentation, multiple requests for Willie’s autograph confirmed his great classroom success. Willie has spoken on this same subject for decades, captivating audiences at schools, social clubs and community organizations throughout southeast Louisiana. The secret to Willie’s success is his ability to bring real emotion and personal relationships to the topic, conjuring vivid portrayals that lead audiences to imagine they were there when it was happening. Willie can do that because he actually was there. 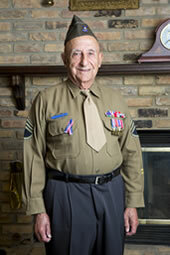 On the front lines during WWII, Willie’s personal experiences during the war earned him the Purple Heart, the Bronze Star and the Silver Star for saving his sergeant’s life during the infamous Battle of the Bulge. Willie has a lot of stories to tell because he lived the events, and his riveting, first-hand account of details from this time can be far more compelling than any book or movie on the subject. Willie Bader’s life experience has granted him a rare, insider’s view of events that have shaped the world we live in today. More importantly, he has capitalized on these opportunities to observe human behaviors and hone his ability to accurately assess and identify the motivators behind a particular person’s actions. Willie relates and communicates with individuals and audiences of all ages and backgrounds—an invaluable skill for someone with great knowledge to share. Willie Bader … Peoples Health Champion.